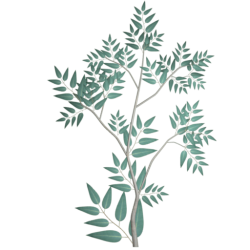 A first attempt at a low poly (1266 triangles) gum tree. Originally intended as an entry into the friday challenge "Touch of Nature", I had to learn a lot of new techniques which was the cause of my missing the "Friday" deadline. All textures are original, under the same licence(s) as specified for the model. 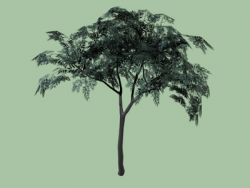 Archive includes .blend files for the model, and the pre-rendered branch, as well as textures for the bark, and leaves. This looks beautiful! Did you use some of those tree-gen-apps for any step in creating this? The background color somehow really fits well..
Do you use particles for leafs or only triangles ? 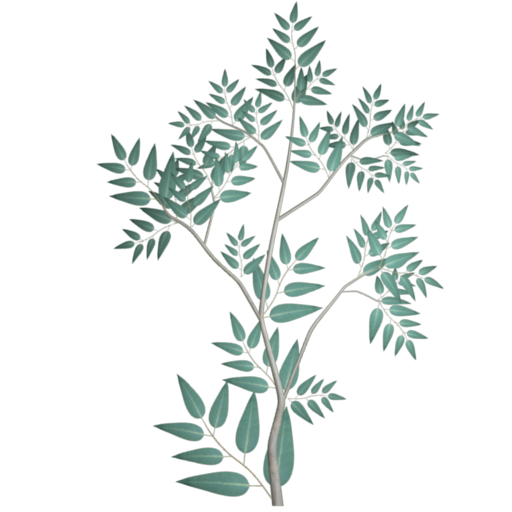 The leaves and smaller branches are modelled in a separate .blend file (which I've also uploaded), and then rendered out to a .png file. I then create a simple geometry which has the pre-rendered branch as a texture. This geometry is then replicated many times around the tree to build the canopy. I've added two new "additional previews" to show this. The first shows a single instance of the simple geometry, while the second show the actual pre-rendered tree branch. Ok, thanks for your explanation ! Someone at the #panda3d IRC channel told me that there might be an issue with the UV-mapping. Could this be the case, and if so, do you know how to fix it? I haven't tried to import this model into any game/graphics engine yet, and I was wondering how the alpha transparency would work out. Thanks for sharing. Anyway, the black tip of the branch seems to be a little off the end of the mapped branch image, so I had a look, and sure enough, the UV map spilled over the edge of the image by just a fraction. Blender must have filled this with more alpha so I hadn't noticed. I've fixed this problem now, and updated the files. I noticed two issues with the updated version: there's one branch floating next to the tree, and the texture for the wood doesn't seem used. Hmm... It seems the most recent model I uploaded didn't have a material applied for the bark texture (I'm sure I put it in there. I wonder where it went). I've created a new one and uploaded the new model again. The floating branch is for easy editing of all the branches (Thanks to linked duplicates, editing one branch will edit all the branches). You just didn't see it in the first version because it was most likely hidden on another layer (press "1" in blender to hide all but the tree model). Yes, at over 1200 triangles each, the model isn't really suited for games designed to run on low end hardware, and even then you wouldn't want more than few rendered at any one time. > Would it be possible to have a version with less branches? It would, but it depends on where you want to use it. 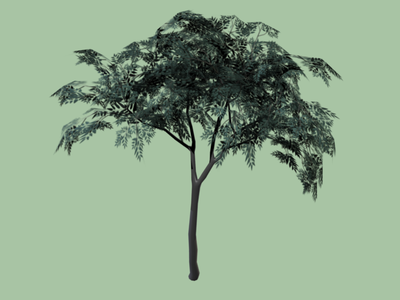 If you wanted something lower poly as a general purpose replacement (so you can have a lot of these), it might be somewhat tricky to do without making the tree look "spindly", but I could give it a go. 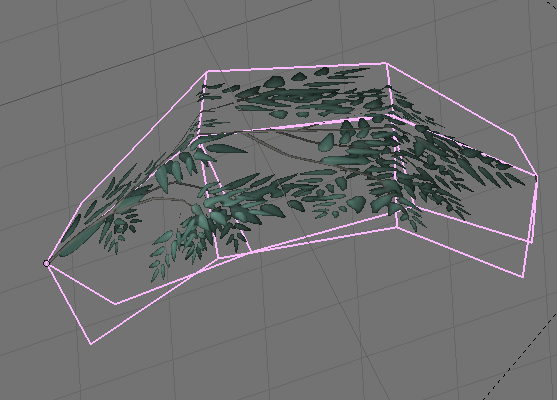 I could also make some low(er) poly variations for different Level Of Detail's if that's what your after? In any case it may be a couple of weeks before I get the time though. Hi lattice, I just wanted to drop you a note to say I've exported your tree for use with UFO: Alien Invasion. It's going to go into our forest map which is getting reworked at the moment. Thanks for the great tree! You can see the license info saved in our project here. Thanks for letting me know, and thanks for choosing my model. I'm surprised how useful my modest contribution has been to people. I had originally intended to model a series of trees and bushes of similar style, and seeing how successful just one has been, I'm inspired to attempt this again. This is magnificent. Using these in Flare's overworld tile set.